Have you ever been caught tongue-tied when someone says, “So tell me about yourself” in a job interview or asks, “What’s your story?” at a networking event? 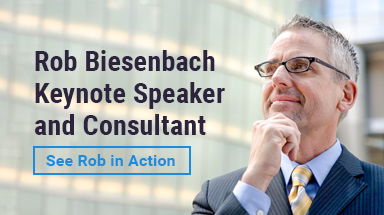 This Friday I’ll be conducting a free webinar that will help you tell your story in a way that makes a strong first impression and get the results you want, whether it’s to nail a job interview, forge a strong connection or win over an audience. Too often when we’re put on the spot we resort to a chronological recitation of our work history. It’s like a staged reading of a LinkedIn profile — just an alphabet soup of organization names, job titles, dates, numbers and dollar figures. It’s all data with no heart. Nothing for the listener to really grab onto and nothing that sets you apart from the crowd. Another alternative is the dreaded elevator pitch. When I ask audiences how many have ever worked on an elevator pitch, nearly every hand goes up. When I ask how many are happy with that pitch and use it consistently, nearly every hand goes down. The truth is, most elevator pitches are not very good. It’s right there in the name: nobody wants to be “pitched” and few of us want to do the pitching. An elevator pitch is supposed to “sell” you without sounding too salesy, but that’s a hard line to toe. For that reason, elevator pitches rarely feel natural and they’re hard to weave into a conversation organically. A story, on the other hand, carries unparalleled power to break down walls, build trust and influence people to act. 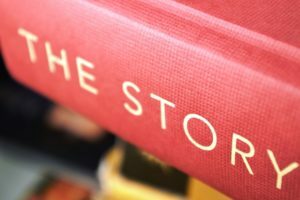 A great story can help differentiate you from others. After all, many people may share similar accomplishments, but nobody has your unique story. Your finished story will capture who you are, what you do, and what you have to offer in a way that engages the listener, sparks a productive, beneficial conversation and feels natural and easy for you to deliver. The webinar is sponsored by my alma mater, the University of Virginia, and is free and open to everyone. You just need to register in advance. It’s happening Friday, January 26 at noon ET. If you have a conflict at that time, don’t worry. They will send you a link to the recording afterwards. But you can’t get the recording without registering first. So sign up right away, You don’t want miss this awesome opportunity to advance your career and go into any situation armed with the ability to present yourself in the best light possible. 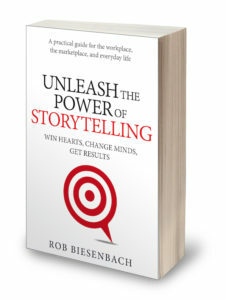 I have a whole chapter devoted to telling your story in my upcoming book, Unleash the Power of Storytelling: Win Hearts, Change Minds, Get Results. To get a free look at that chapter, sign up here for your preview copy. 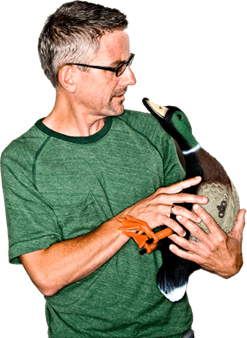 It makes a great supplement to the webinar, or can stand on its own if you’re more the reading than watching type. And when you sign up, you’ll also get first word when the full book is ready, qualifying you for a significant discount off the cover price. Hope to see you there on Friday!